The aviation industry is a major source of greenhouse gas emissions. In 2011, aviation contributed around 3% of Australia's emissions. Despite improvements in efficiency, global aviation emissions are expected to grow 70% by 2020 from 2005. While the industry is seeking new renewable fuel sources, growing biofuels takes up valuable land and water that could be otherwise used to grow food. But what if you could grow biofuels on land nobody wants, using just seawater and sunlight, and produce food at the same time? That's just what a new project in Abu Dhabi is seeking to do. The Integrated Seawater Energy and Agriculture System, or ISEAS, will grow sustainable food and aviation fuel in the desert, using seawater and sunshine, in a way that is eminently transferable to similar arid regions around the world. The project was announced in January 2015 and is now under construction. So, how does the project solve the biggest environmental problems? Energy, water and food problems frequently compound each other, each making the others more difficult to resolve. Examples abound. Think of wasteful irrigation coming up against water limits and threatening reductions in food production. But there are some projects that turn the issue around and bring water, energy and food issues into positive relations, each strengthening the others. 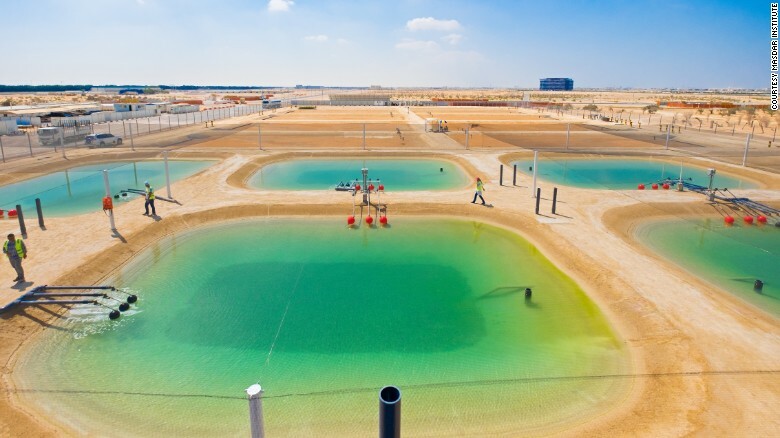 The Integrated Seawater Energy and Agriculture System in Abu Dhabi, the UAE. One example of this is the Sundrop Farms project in South Australia, where abundant sunshine and seawater are used to produce electric power and fresh water to cultivate greenhouse crops like tomatoes. The Sundrop Farms project is moving ahead, and has won substantial financial support from the global venture capital firm KKR in addition to its earlier support from the Clean Energy Finance Corporation, as well as a contract to supply fresh produce to supermarket chain Coles over the next ten years. The Abu Dhabi project is even more ambitious and is called "seawater farming". 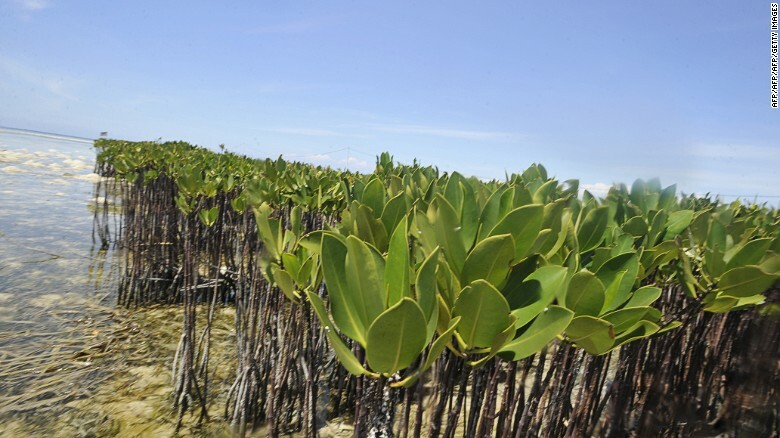 It involves the use of salt-tolerant plants like mangroves and the oil-rich Salicornia as well as aquaculture of seafood such as shrimps and fish. Sea tolerant plants like mangroves will feature in the Abu Dhabi project. The project was developed through the Sustainable Bioenergy Research Consortium in Abu Dhabi. It involves as partners the airline Etihad Airways, the Masdar Institute of Science and Technology (from the UAE), as well as corporate giants Boeing, General Electric and UOP Honeywell. These corporations provide the funding and a potentially (vast) market. The idea is to rapidly scale up various options for securing the biomass and complementing it with associated activities to generate a closed loop operation. A group of women drink tea under the shade of a tent and cast an eye over the construction of an odd, circular house. The half-built dwelling is the brainchild of Tateh Lehbib Braica, 27, an engineer who wanders among the workers. On the ground lie hundreds of sand-filled, 1.5 litre plastic bottles that serve as bricks. With them, Tateh has found a way to fight back against the harshness of the Algerian desert that is home to 90,000 long-term refugees from western Sahara. It’s not yet that hot, but in summer, when the temperature rises above 50C, it will be impossible to venture out of doors. “I was born in a sun-dried brick house,” he says. “The roof was made of sheets of zinc – one of the best heat conductors. Me and my family had to endure high temperatures, rain and sandstorms that would sometimes take the roof off. The houses possess several qualities that equip them for the brutal ecosystem of the Algerian hamada, the so-called desert of all deserts. The walls are made of sand-filled plastic bottles, cement and a mixture of earth and straw that acts as thermal insulation. Compared with the traditional sun-dried bricks, which fall apart in the rains that batter the region from time to time, they are very tough. Their circular shape serves a dual purpose: not only does it stop dunes forming during sandstorms as happens with square houses, it also – along with the white-painted exterior – reduces the impact of solar rays by up to 90%. A double roof with a ventilation space and two windows set at different heights to encourage air flow mean that temperatures are 5C lower than in the other houses in the camps. The floods of 2015 and 2016 destroyed 9,000 homes and 60% of the camps’ already scant infrastructure, according to the UN refugee agency, UNHCR. Tateh’s idea reached the UNHCR’s Geneva HQ and it was selected as a pilot project. The agency’s grant of about €55,000 (£43,000) has seen 25 more houses built in the five Sahrawi refugee camps in the Algerian province of Tindouf. Tateh’s circular homes have sprung from the ground in the camps of El Aaiún, Auserd, Smara, Bojador and Dajla, all of which are named after the western Saharan cities from which thousands of people fled in 1975 after the so-called Green March and Moroccan occupation. Much of the scheme’s success lies in its low-cost and ecological benefits. Each house needs about 6,000 bottles and takes a team of four people a week to build. “We don’t have modern recycling like they do in other countries, but we can make use of all the tonnes of plastic,” says Tateh, who studied renewable energy at Algiers University followed by a masters in energy efficiency at the University of Las Palmas in Gran Canaria thanks to an Erasmus Mundus grant from the EU. Could this be the Nuclear Eureka moment ? A COLD fusion machine aimed at creating limitless supplies of energy from a few litres of seawater has been fired-up and is working exactly as the designers hoped. The mind-bogglingly complex “star-chamber” called the Wendelstein 7-X creates clean, radiation-free nuclear energy by mimicking what happens in stars like our own sun. Cold fusion – based on safe nuclear fusion rather than the dangerous nuclear fusion of the world’s current reactors has been the dream of physicists since the 1950s. But the technique is so fiendishly complex and the conditions so difficult to recreate that many wrote it off as a pipe dream. But the experimental Wendelstein 7-X – one of the most complex machines ever designed – is working perfefctly according to a new study. The Wendelstein 7-X uses a machine with the fabulously science fiction name – a stellarator. It confines super-heated helium – in plasma form – to spark reactions in twisted three dimensional magnetic fields. The Wendelstein 7-X which is five meters across and in a laboratory in Germany was originally designed as a proof-of-concept. It has now been shown conclusively to work. And the developers can now focus on creating new designs that improve the efficiency of the device.